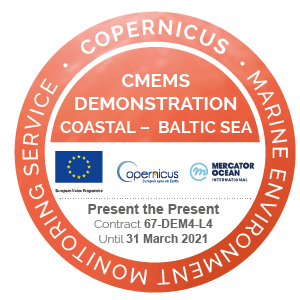 Demonstration Present the present will be presented in Copernicus Marine Environment Monitoring Service General Assembly in Brussels, May (20-24), 2019. The next question of the Present the present contest will be published on 18th of April 2019. The next release of the Present the present demonstration including the drift forecast functionality will be available in May 2019. The release of the final version of the Present the present demonstration and the national CMEMS and FIMAR user seminar is planned in November 2019 (synchronising it with the 100-year anniversary of University of Latvia).